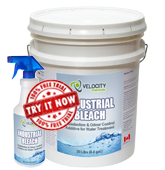 INDUSTRIAL BLEACH is a very effective, highly concentrated chlorinated bleach additive for disinfection and odour control for treating polluted water. It is used for treating polluted water containing organic contaminates and waterborne pathogens, etc. INDUSTRIAL BLEACH is used in conjunction with other water treatment products such as coagulants, flocculants and others to give good clarity to water in the treatment process. The use concentration of INDUSTRIAL BLEACH for a particular water stream is dictated by the types of contaminates, the amount of solids, etc. All water streams are unique and are not the same. Therefore, the customer should contact our sales representative for technical advice before processing water.